In many parts of the country, the number of motorcycle crashes drops sharply between October and June. It’s simply too cold to ride. But here in Georgia, it is always motorcycle crash season. Winter in Marietta is a lot like spring in New York City and Chicago. Except for a few days here and there, it’s never too cold to ride in Marietta. One would think that the year-round motorcycle traffic would make other drivers more aware of riders and decrease the number of crashes. However, as outlined below, that’s simply not the case. Damages in a motorcycle crash claim usually include compensation for economic losses, such as medical bills, and noneconomic losses, such as pain and suffering. Additional punitive damages may be available as well, in some extreme cases. Most riders who have gone down heard the tortfeasor (negligent driver) who caused the crash say something like “I never saw you at all” or “You came out of nowhere.” In other words, the tortfeasor implies that the rider was operating recklessly and the crash was therefore inevitable. But that’s normally not the case. When drivers say they did not see the motorcycle, they are basically admitting that they failed to keep a proper lookout. According to the landmark Hurt Report, driver inattention causes about a third of the vehicle-on-motorcycle crashes in Marietta. Most typically, the tortfeasor tries to make a left turn against traffic, does not see an approaching motorcycle, suddenly accelerates to shoot through a gap in traffic, and pulls directly into the rider’s path. Such visibility-related crashes are probably more of a problem today than they were when the Hurt Report was released. In 2019, many people drive large SUVs or big pickup trucks. These vehicles are hard to see around, especially when the driver is not looking out for motorcycle riders in the first place. In other parts of the world, these left-turn crashes are called SMIDSY crashes, for “Sorry, mate, I didn’t see you.” Another acronym, TBFTL for “turned but failed to look,” does not have the same je ne sais quoi. Moreover, TBFTL does not capture the cavalier attitude which many tortfeasors have toward motorcycle crash victims. Alcohol is even a bigger problem. Impaired drivers cause almost half of the motorcycle-vehicle collisions in Cobb County. Alcohol slows reaction time and impairs judgement. If these brain activities are not functioning properly, it’s very dangerous to drive a car or operate other heavy machinery. Furthermore, most people are not intoxicated until they consume three or four drinks. But impairment begins with the first sip of alcohol. Head Injuries: Motorcycle helmets reduce, but do not eliminate, head injuries. Protective headgear only helps against trauma-related head injuries. But violent motion also causes a number of these injuries. A vehicle wreck often scrambles the brain without cracking the skull, just like a person can scramble an egg without breaking the shell. Internal Bleeding: Exsanguination is usually the specific cause of death in motorcycle crashes. Since they have no protective skin layer, internal organs often bleed profusely. So, by the time emergency responders arrive, the victim may be on the edge of hypovolemic shock and organ shutdown. Road Burns: Although they are not life-threatening, these large abrasions are quite debilitating. The rash on the victim’s leg is extremely painful and makes moving around difficult. Time is pretty much the only cure for road burns, so the disability may last for several weeks or months. Given the serious nature of these and other injuries, it’s very important for victims to get medical attention straightaway. Most of these injuries get much worse without immediate and proper treatment. Unfortunately, many health insurance companies do not cover collision-related expenses. And, most people do not have the money to see a doctor without insurance, especially if they require massive assistance. A Marietta personal injury attorney can connect victims with doctors, even if they have no insurance or money. The doctor agrees to defer payment until the case is resolved. So, victims pay nothing upfront for top-quality medical care. These wrecks cause such catastrophic injuries that, in many cases, the individual tortfeasor does not have enough insurance coverage to fully compensate the victim/plaintiff. Georgia has one of the lowest auto insurance minimums in the country, and the company only pays, at most, the policy limit. Vicarious liability is particularly important in these cases. If there is another source of recovery, it’s easier to obtain fair compensation. Minor: If the tortfeasor was under 21, the provider may be liable as a matter of law. In this context, even a fake ID defense may not hold water. Noticeably Intoxicated: If the tortfeasor was an adult and noticeably intoxicated, it’s illegal to sell alcohol to that person. Evidence of intoxication includes bloodshot eyes, slurred speech, and unsteady balance. The dram shop law might apply even if the motorcycle rider was intoxicated and caused the crash. The liability rules remain the same even in that context. Other vicarious liability rules include respondent superior (“let the master answer”). Employers are legally responsible for the negligent acts of their employees who are operating within the course and scope of employment. That description includes delivery drivers, Uber drivers, and any other operator whose driving benefits an employer in any way. Other employer liability theories include negligent hiring and negligent supervision. These doctrines often apply in intentional tort claims, such as nursing home abuse cases. 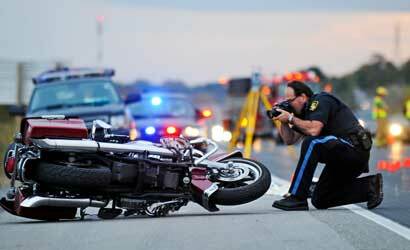 Motorcycle crashes often cause serious injuries. For a free consultation with an experienced personal injury attorney in Marietta, contact The Phillips Law Firm, LLC. We do not charge upfront legal fees in negligence cases.